ments reached Gouy. In this and later actions from October 6 to 19, our Second Corps captured over 6,000 prisoners and advanced about 24 kilometers. 52. 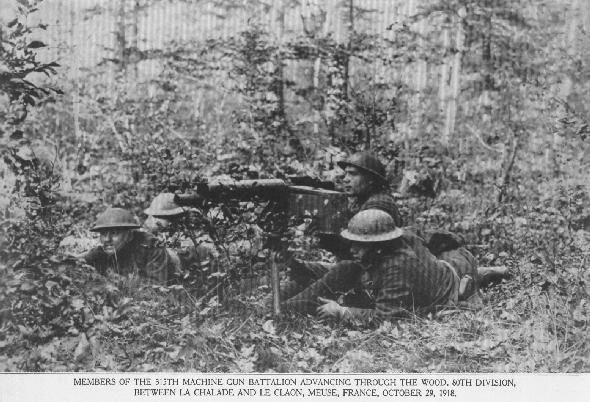 On October 2-9 our Second and Thirty-sixth Divisions assisted the Fourth French Army in its advance between Rheims and the Argonne. The Second Division completed its advance on this front by the assault of the wooded heights of Mont Blanc, the key point of the German position, which was captured with consummate dash and skill. The division here repulsed violent counterattacks, and then carried our lines into the village of St. Etienne, thus forcing the Germans to fall back before Rheims and yield positions which they had held since September, 1914. On October 10 the Thirty-sixth Division relieved the Second, exploiting the latter’s success, and in two days advanced, with the French, a distance of 21 kilometers, the enemy retiring behind the Aisne River. 53. In the middle of October, while we were heavily engaged in the Meuse-Argonne, Marshal Foch requested that 2 American divisions be sent immediately to assist the Sixth French Army in Belgium, where slow progress was being made. The Thirty-seventh and Ninety-first Divisions, the latter being accompanied by the Artillery of the Twenty-eighth Division, were hurriedly dispatched to the Belgian front. On October 30, in continuation of the Flanders offensive, these divisions entered the line and attacked. By November 3 the Thirty-seventh Division had completed its mission by rapidly driving the enemy across the Escaut River and had firmly established itself on the east bank, while the Ninety-first Division, in a spirited advance, captured Spitaals Bosschen, reached the Scheldt, and entered Audenarde. 54. The Italian Government early made request for American troops, but the critical situation on the western front made it necessary to concentrate our efforts there. When the Secretary of War was in Italy during April, 1918, he was urged to send American troops to Italy to show America’s interest in the Italian situation and to strengthen Italian morale. Similarly a request was made by the Italian Prime Minister at the Abbeville conference. It was finally decided to send one regiment to Italy with the necessary hospital and auxiliary services, and the Three hundred and thirty-second Infantry was selected, reaching the Italian front in July, 1918. These troops participated in action against the Austrians in the fall of 1918 at the crossing of the Piave River and in the final pursuit of the Austrian Army.